I bet the summer is coming to an end soon in northern hemisphere. One thing I love about the summer is the abundance of beautiful tomatoes and herbs in the garden or in the farmer’s market. 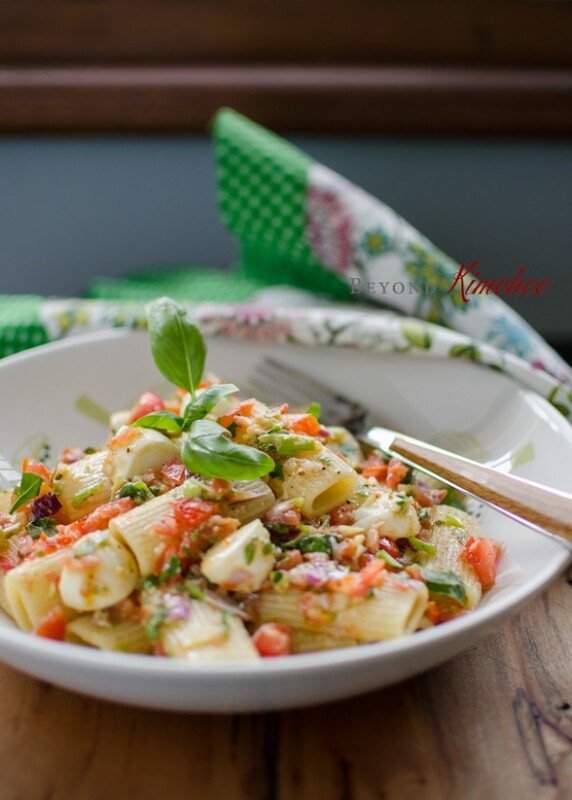 I have been making this Pasta with Checca sauce (aka pasta alla cecca) for many years whenever I get the juicy plump tomatoes and a bunch of fresh basil in hand. With the addition of some garlic, green onion, olive oil, and Parmesan cheese, you can taste the summer of Italy in your home. Yuppy-doo~!!! Ever since I saw an episode of Giada De Laurentils making this Checca sauce I was hooked and my family loved it, too. I have modified the recipe to the way I like it. 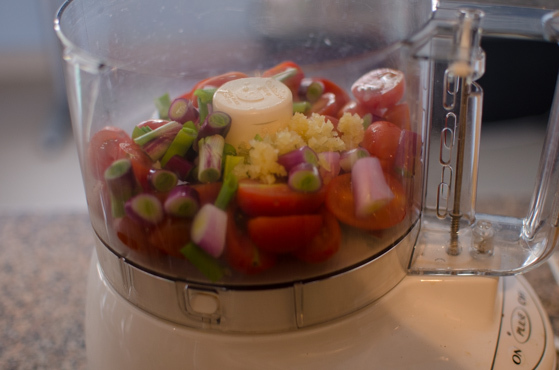 If you have a food processor, this sauce can be put together faster than your pasta being cooked in a boiling water. 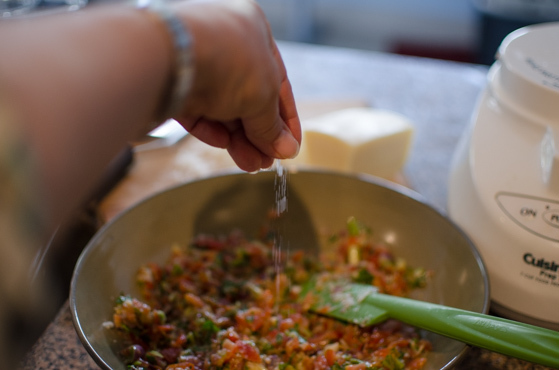 However, I sometimes chop everything with a knife, too, leaving the sauce with the bigger chunks of tomatoes and basil. This uncooked sauce has raw garlic in it, so be aware. 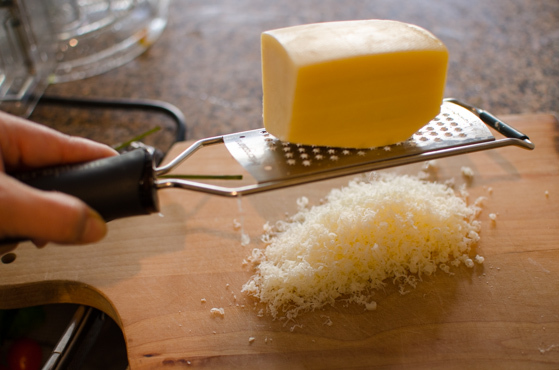 I like to mince my garlic finely before I add to the food processor so that I don’t have to bite on a big chunk. 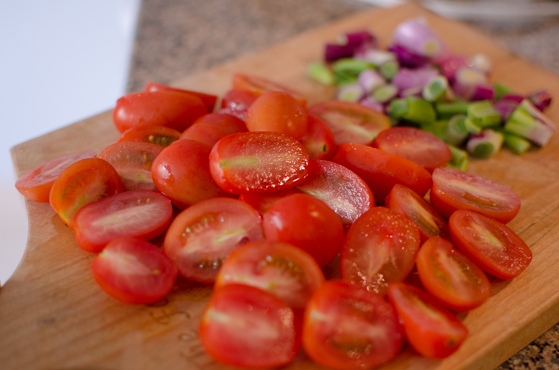 Since it is no cook fresh tomato sauce, it is important to use the best tomatoes you can get. Do not use those semi-ripe flavorless tomatoes you see in the grocery store. I recommend to use those ugly-looking, yet full ripe firm fresh tomatoes you can get in the farmer’s market. Or use fresh cherry of grape tomatoes. They yield sweeter in taste. and a bunch of basil leaves. I used about my handful. You can’t go wrong with basil, so use however much you desire. 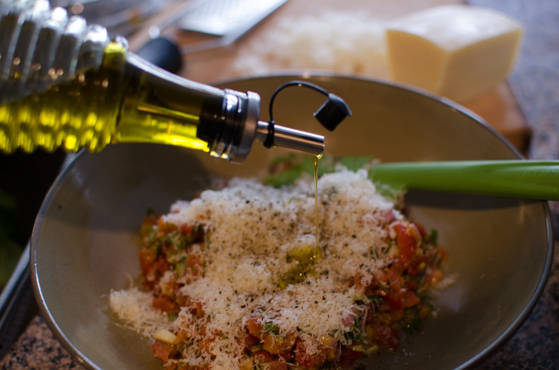 Drizzle olive oil. Pulse until the tomatoes are just coarsely chopped. and add to the sauce. 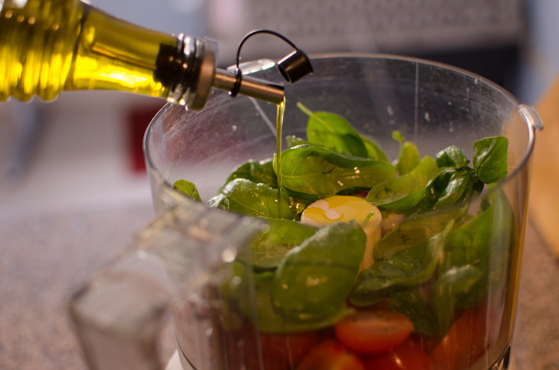 Drizzle more olive oil if the sauce seems too thick. Season with salt and pepper, and toss all together. 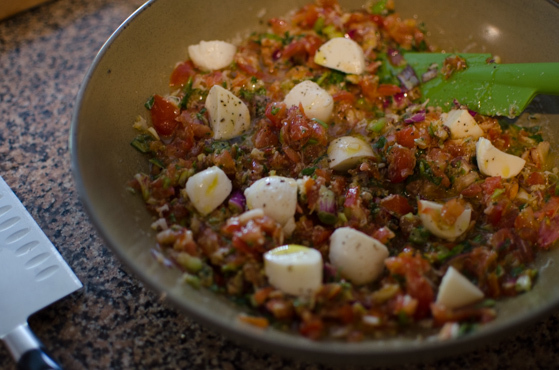 And add chunks of fresh mozzarella at the end to celebrate the colors of Italian flag; the red, green and white! I used Rigatoni pasta but any pasta would be great with checca sauce. 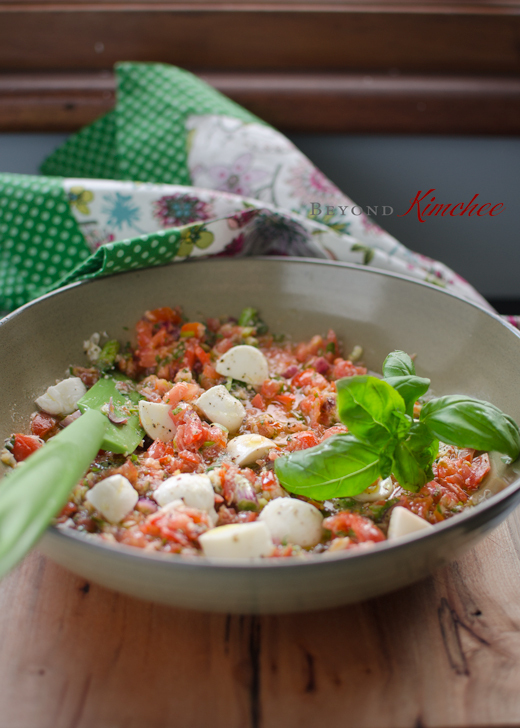 If you love the flavor combination of fresh tomatoes and basil, you will love this. Yum! Cook the pasta in the boiling water until al dente or according to the package direction. 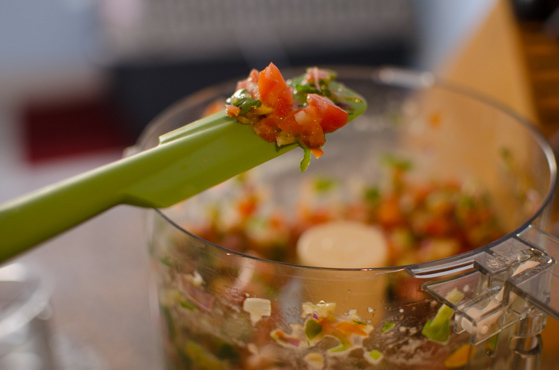 In a food processor, pulse together tomatoes, green onion, basil leaves, garlic, 3 tablespoon olive oil until they are coarsely chopped. Transfer to a large mixing bowl and add Parmesan cheese and more olive oil, if needed, salt and pepper to taste, and mix everything well. Add the fresh mozzarella to the sauce. Great dish! 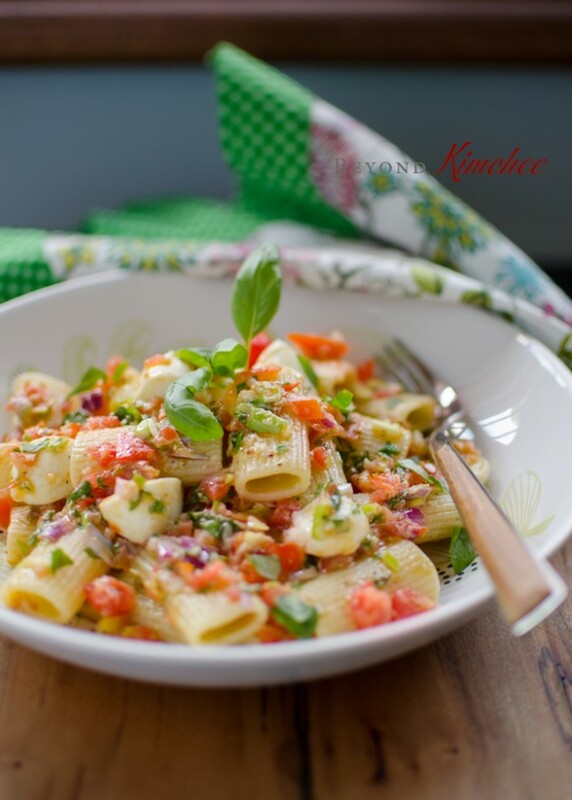 I just love combining fresh tomatoes and herbs with pasta at this time of the year -- such terrific flavor. Thanks for this. It`s still super hot where I live, so I still feel that Summer is in full swing. Haha! I haven`t heard of pasta with checca sauce before. 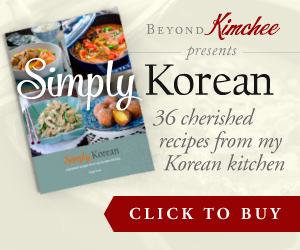 I love seeing pasta recipes I`ve never heard of! Makes it very intriguing.